The Almkanal is a network of tunnels that connects much of the Old Town (Altstadt) of Salzburg under ground. It is considered to be the oldest canal system of Central Europe and probably dates back to the 8th century. The "modern" construction of the Almkanal started in 1137, by using materials from the Roman ruins that originated from Iuvavum, the Roman city at the site of modern Salzburg. The Almkanal is in total at least 18 kilometres long and not a sightseeing attraction in the classical sense of the word - consider this article to provide real and behind-the-scenes information rather than the usual tourism blabla. That being said, there are several spots where tourists can encounter branches of the Almkanal even in the city centre: At the Universitätsplatz (right next to the Kollegienkirche), a fountain was built by Boris Podrecca. 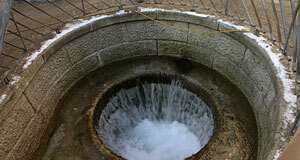 Most people think it is only a well, but in fact, it is the biggest open surface of the Almkanal before it enters the Salzach River. Another noteworthy spot can be found on the premises of St. Peter′s Abbey: Enter the cemetery from Kapitelplatz square and you will see a water mill that is run by the water of the Almkanal. The mill is part of the bakery of the monastery, by far the oldest bakery of Salzburg (even though rumour has it that it was located at the Gstättengasse). Speaking of the latter: In 2004, a window was built that allows you to catch a glance of the Almkanal at this section. The fourth open access to the Almkanal from the city centre can be found at the base station of the Festungsbahn, the railway to the Fortress Hohensalzburg. Indirectly, you will encounter the Almkanal in the Salzburg Museum: The air-conditioning of the museum utilises the cold water of the Almkanal, which also applies for the Festspielhaus (Festival Hall). So what exactly is the Almkanal? The network of tunnels was started in an initial building phase between 1137 and 1143 and incorporated sections in Mülln that were probably built in the 8th century. The Domkapitel (sort of the board of the directors of the Salzburger Dom) and the monastery of St. Peter funded the work, which was done to provide the city with access to water power (mills) and pure spring water. When this canal was completed, it was 370 metres long, approximately one metre wide and some 1.5 to 2.2 metres high. Thus, the Almkanal was a proper tunnel from the beginning and we think it is fair to assume that it was also built in a way that it would make a formidable passage out of the city in case of emergencies (such as attacks - this was the time of the Investitutstreit, a power struggle between pope and emperor). However, the Almkanal was soon too small to allow enough water to run through. The Almkanal was permanently extended throughout the late Middle Ages and Renaissance time. In the 17th century, Salzburg reached a new climax and was wealthier and more powerful than ever before. Many fountains were built in Baroque style, it was usually the Almkanal that provided the necessary water. Note for example the Pferdeschwemme or Kapitelschwemme. In addition to freshwater supply, the Almkanal was also crucial for many locksmiths, pump houses and mills as a source of energy. The 17th century was also a period of political turbulence. Prince Archbishop Paris Lodron invested vast amounts of money to fortify Salzburg during the 30-Years-War. He also spent quite a lot of cash on extending the Almkanal network, and again we assume that the dual-functionality of water canal and escape route was the motivation behind this. Why is that? Because whenever there was danger, the people of Salzburg did what they have done for millennia: Seek shelter in the mountains. A bit like dwarves in a Tolkien fantasy, the hills around Salzburg provided sanctuaries for persecuted women accused of witchcraft, for protestants, for pagan customs and Adolf Hitler (note the nearby Kehlsteinhaus). As a result, the hills in the immediate surroundings of Salzburg have tunnels running through them all over. An anonymous friend of the editorial team, who is a passionate amateur caver, swears that there is an underground link between the old Wehrmacht barracks in Berchtesgaden (at the base of the Kehlsteinhaus mountain) and the city of Salzburg which ends in the Almkanal. He also states that a side-branch of the Almkanal runs under the Salzach river and through the Kapuzinerberg, where the tunnel exits. Whilst this might be just a tale caused by too little oxygen in the often flooded caves of the Almkanal, one thing is granted: Many of the tunnels are very hard to date, since they use material dating back to antiquity. In September, when large sections of the Almkanal are closed for maintenance, the tourist council sometimes organises guided tours in sections under the Altstadt. On such tours, you can marvel at Roman tombstones that were used for covering the inside of the Almkanal. You are wondering about the maintenance? Well, the Almkanal is still a functioning canal, operated by the city council. It even powers three hydropower plants: One for the Stiegl-bewery; one for the Augustiner brewery in Mülln; the other one is used only in emergencies to provide electricity to hospitals and other key-facilities in Salzburg in case of a major disaster. Once again, the Almkanal proves that it is a real lifeline for the city.